Is it actually August 28th today?! As I type this it is down pouring rain outside and I am bundled up in a scarf watching 'comedy gold', sipping hot tea and soothing a sore throat. It's definite that summer is coming to a close and fall is fast approaching. As sad as it is to see the summer fun fade away, I've always loved that feeling of transitioning into fall - back to school, falling leaves, Thanksgiving, and all of the other exciting fall events. Don't get me wrong I adore all seasons of fashion, but I think I'm not alone when I say that fall takes the cake. The fall months are perfect for layering and mixing in colours that you probably haven't worn in close to a year. This season I am all about the berry. I love a good berry accent in a fall ensemble and these nine are some of my favourites you can mix into your everyday fall looks. Thank you for stopping by and have a wonderful Wednesday! Fall is my favourite season to dress for! 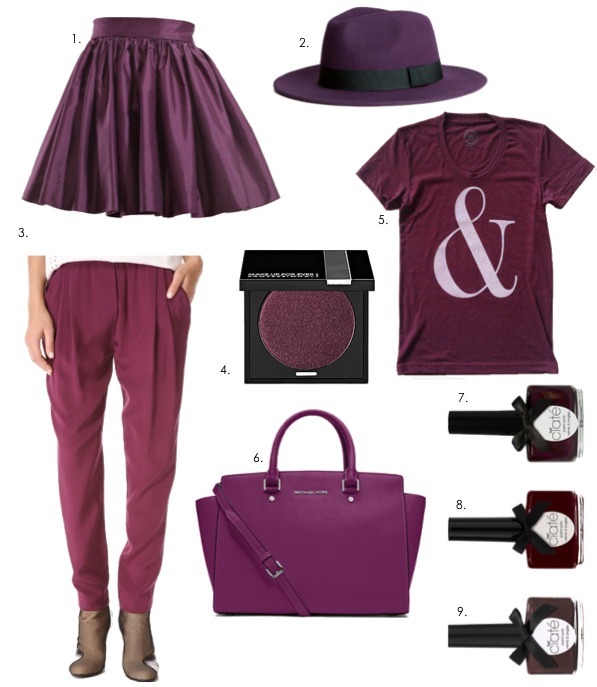 Berry is one of my favourite colours, I need to order that ampersand tee!